Olivia Grace Clarisse Mignonette Harrison still finds it hard to believe that she's a real live PRINCESS OF GENOVIA. Not only does she get to live in an actual palace with her newly discovered family and two fabulous poodles (who all love her and think that she's anything but ordinary! ), but she also gets her very own PONY! Of course, things aren't going exactly like she imagined. Her half-sister Mia is very busy learning how to take over the country while trying to plan a wedding and her father is actually getting remarried himself to Mia's mother! and spends most of his time"renovating" the summer palace, although Grandmere says he is just hiding from the wedding preparations. Olivia hardly gets to see either of them. Fortunately, Grandmere has her own plans for Mia's wedding, and needs Olivia's help to pull them off. Just when Olivia starts to think that things are going to work out after all, the palace is invaded by a host of new cousins and other royals who all seem to be angry at Olivia (although Grandmere says they are just jealous). As the day of the wedding gets closer and closer, Olivia becomes more and more worried. For such a carefully planned event, it seems like a LOT of things are going wrong... Can Olivia keep this royal wedding from becoming a royal disaster? The nation of Genovia gains a new resident in this amusing spin-off...Cabot's own black and white cartoons further enliven Olivia's entertaining and candid notebook entries, which will have readers looking forward to her future escapades. "Publishers Weekly " on" From the Notebooks of a Middle School Princess"
Cabot manages to combine wit and lavish details to positive effect...newcomers to the Cabot magic will be charmed. A sweet fantasy, both funny and highly satisfying. "Kirkus" on" From the Notebooks of a Middle School Princess"
This entertaining, quickly absorbing read will have readers anticipating the sequel. 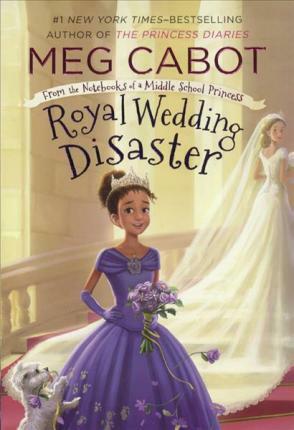 "Booklist "on" From the Notebooks of a Middle School Princess"
This sweet and sassy spin-off featuring the younger half-sister of Princess Mia Thermopolis ...will be a perfect fit for Fancy Nancy alumni and readers not quite ready for Cabot's longer novels. "School Library Journal "on" From the Notebooks of a Middle School Princess""
Meg Cabot is the #1 New York Times bestselling author of the Princess Diaries series, with over 25 million copies of her books sold worldwide. Born and raised in Bloomington, Indiana, Meg also lived in Grenoble, France, and Carmel, California, before moving to New York City after graduating with a bachelor's degree in fine arts from Indiana University. She is the author of numerous books for adults and children, but From the Notebooks of a Middle School Princess is the first series she's illustrated. Meg Cabot currently lives in Key West with her husband and cat.